Ford Fiesta named Used Car of the Year | What Car? What Car? 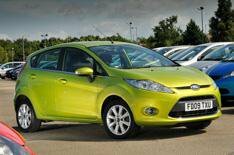 has named the Ford Fiesta 1.25 Zetec 5dr as its Used Car of the Year 2012 and used supermini of the year. The Ford Mondeo was voted the best used family car, while the Ford S-Max won the best used MPV trophy, taking Fords tally of awards to three. Last years overall winner, the Nissan Qashqai, was voted best used SUV, with judges praising its spacious and classy cabin, comfortable ride and commanding view. Volkswagen picked up two awards. The Golf was named best used small family car and the Passat Estate best used estate car. The Toyota Aygo was named best used city car. The judges said that the Aygos blend of funky styling and rock-bottom running costs were exactly the attributes city car buyers are looking for. The What Car? Used Car of the Year judging panel was picked from all areas of the motor industry, including Fords of Winsford car supermarket, Warranty Direct and CDL Ltd, plus experts from What Car?. As well as selecting the overall Used Car of the Year, the judges picked winners and runners-up in nine categories, looking at running costs, reliability, driveability, quality, longevity, safety features and desirability.